深町 (Fukamachi) is one of the best tempura restaurantS in Tokyo. It is a really small restaurant with about 10 counter seats and 3 tables with 2 pax each table in Ginza area. Fukamachi locates on a quite small street in Ginza, but not very hard to find because there are few restaurants on that street. It was our first time having tempura at a speciality tempura restaurant, sitting at the counter and watching the chef making the most fresh tempuras in front of us! Couldn't wait to see! Table setting, with garnished dakon (radish/turnip), lemon, sea salt and soy. The chef will tell you which dipping is the best to serve with depends on different kind of tempura. The dakon is all-time suitable, for clear off the flavors from previous piece. For the dinner menu, only set menus are available.There are 3 sets available depends on the number of pieces. And some of the pieces can actually do a la carte such as the signature uni tempura. This appetizer looks very simple but was so good and refreshing. P1040629鱚(きす,Kisu) - amazingly tender inside! We ordered the siganture uni tempura(生雲丹) from the a la carte menu. Never had cooked uni before, especially uni tempura. This one was wrapped in shiso to 'protect' the uni. Another piece i really loved. The anago inside was really tender and melting in my mouth, just like those of nigiri sushi. While the outside was crispy. Love it. And finally the rice dish. You can choose either tempura donburi (天丼) which was basically mixed seafood tempura served with sweet soy sauce on top of the rice (UP) or mixed seafood tempura on rice served with green tea (かき揚げ天茶). Whichever you choose, it comes with red miso soup and pickles. We got one each. For my tempura donburi, which was more traditional than the later one.It was seriously perfect and i consider it the best tempura donburi i have ever had in my life. 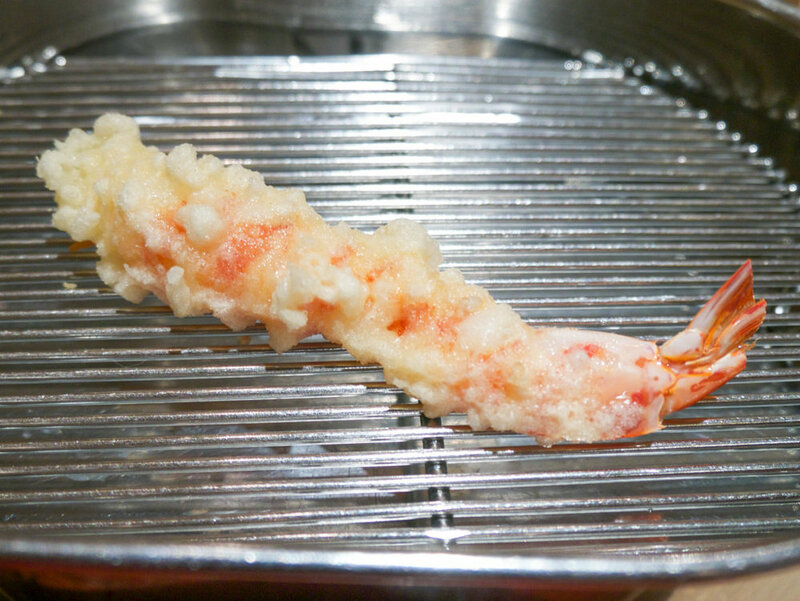 The tempura itself was made of scallops, squid, shrimp and lots of other seafood. The topped sweet soy sauce was housemade by the chef, the sauce was still hot when it served. For my mom's tempura rice with green tea, it really worth a try! It was our first time having tempura rice in this way. Compare to the tradition tempura donburi I had, this one was lighter and taste more simple, but the flavor from the seafood themselves came out into the soup, and made the whole thing perfect. You should try this! And finally the dessert, . Perfect ending. Overall, the dining experience at Fukamachi was really great. It changed my view of tempura, which i thought oily, heavy starch outside, fatty, noutrishless. The tempura at Fukamachi was not oily at all, and all the layers outside were so think and crispy! I think i will really have a hard time having tempura later in my life, because i once had such great quality tempura. Check the lists of all the restaurants i visited in Tokyo.